I just LOVE October! There's so much to love about it, but I especially love that it signals that Fall has officially arrived and Halloween is just around the corner! Bright, happy colors make Halloween one of the funnest for stamping and decorating. 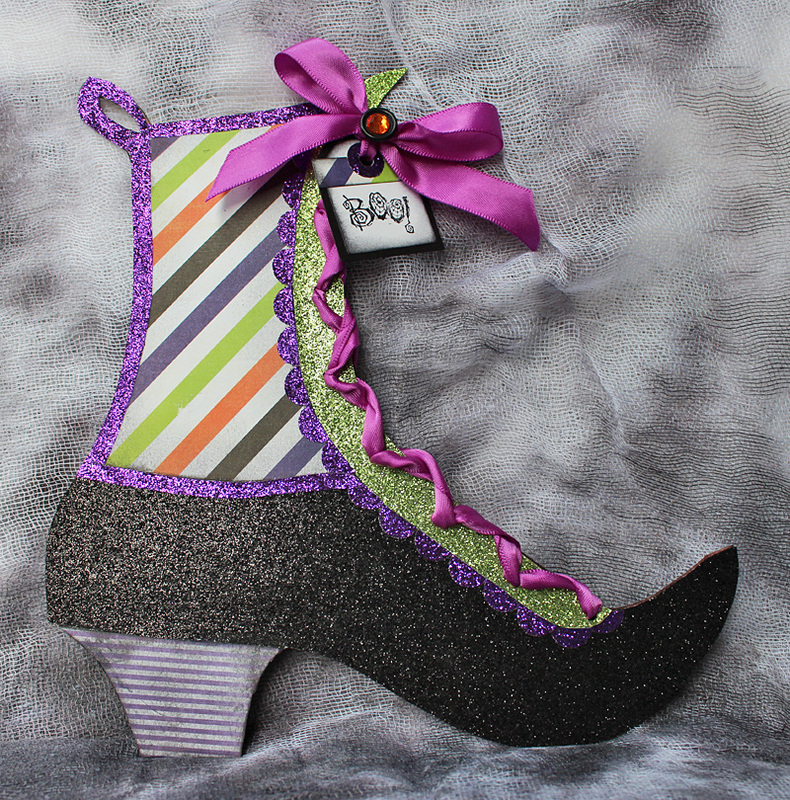 I've seen lots of cute witch's boots on blogs, Pinterest, and Splitcoast Stampers (this one was my favorite!). Most of them were cut with a Cricut or Silhouette, but I decided to try drawing my own template. The whole idea started with some Heidi Swapp papers I got for 50% off at Michael's. 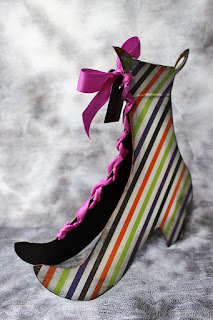 The purple and white pinstripe just reminded me of a pair of boots with a stacked wooden heel... and I thought I could make it work for this month's Challenge Chicks' 3-2-1 challenge. Card stock forms the base for a second paper-pieced layer made from the various patterned paper sections of the boot. The third layer is the sparkly trim, including the scallops made using a circle punch, and the narrow glittery strips that frame the boot shaft. I cut three more boot shapes (one from card stock, another from patterned paper, and a third, reversed, also from patterned paper) to form the back side of the card. It would have been fine to use card stock only, but the patterned papers were cute, they make the project look more finished inside and out, and they're thin enough that they aren't too bulky. Once they were all glued together, I scored about 1 1/2 inches from the top, and glued the finished card front to the top of the finished card back. I used a crop-a-dile to punch holes for the lacing...the top two holes go through all the layers, and the rest go through the front only, so that the card can still flip open. I had a sheet of long-ago stamped sentiments and images from an old SU set (I think it is called Fright Night?!) so I just used my tag punches to punch them out, adding patterned and glittery paper accents to dress it up a little. 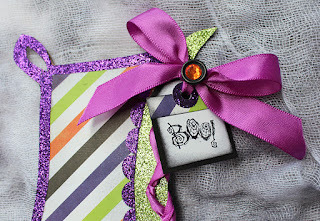 Finished it off with some twisted ribbon and a blingy button, my two favorite embellishments. Be sure to check out the rest of the team's projects! We'd love for you to play along! I took a nice, long, much-needed break from blogging and the pressure of deadlines, and spent some time just crafting for fun. I even set aside stamping altogether to try some other hobbies like spinning and knitting, painting and mixed media. The art and Bible journaling brought me full-circle right back to stamping, so when I was invited to join The Challenge Chicks, I was happy to say yes. This month's challenge is hosted by Jeanne, and the theme is watercolor or ink splats! I recently got some new water-based Dylusions paints, so I did a little test-run on a tag to see how I like 'em. It's fun to experiment on a smaller, less intimidating project before jumping into a larger journal-bound page. I used a paint brush to lay down the first layer of paint in London Blue, then finger-painted a swash of White Linen and Vibrant Turquoise to create an interesting blend of colors. I added some texture with Faber-Castelle Whipped Spackle and a Tim Holtz stencil, repeating the finger-painting process with diluted paint so that the colors were more transparent. Spraying with a mister and creating "splats" with a drippy paintbrush, then blotting the puddles with a paper towel to lift the color helped bring out some really interesting patterns that look like the deep blue-greens of the ocean. The sea turtle images are from a Gina K stamp set, Under the Sea, stamped with Memento ink and colored with Copic markers. The sentiment is from another Gina K set, Gifts from the Sea. A little Donna Salazar Mixed Media ink in honey softened the edges and tied the colors together. A few rhinestone "bubbles" and a ruffly ribbon and it's finished. I'm taking some Jane Davenport art journal drawing classes, and have a few pages in progress, so I'll share those when they're finished. Might even give you a peek at some fibery goodness every once in a while too! All of these things have been part of my healing journey after the loss of first my mom (August 2014) and then my dad (March 31). I am very grateful for the crafts themselves and for the communities and supportive friendships that go along with them. I am a rarely stay-at-home mom who loves to sing and stamp, sometimes all at once! All content (including text, photographs and designs) are copyright Deb Felts. My artwork is shared for personal inspiration only and may not be copied for publication or contest entry.